The Cartoon Cave: Happy Birthday Al Jaffee! 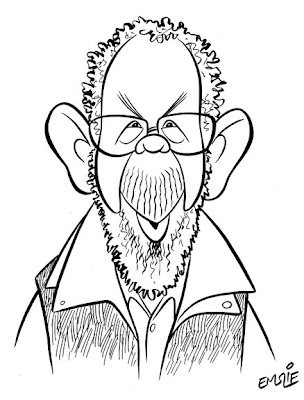 Over at the National Caricaturists Network, Jan Op De Beeck's birthday pick for today is Al Jaffee, the veteran MAD Magazine cartoonist. Al is celebrating his 88th birthday today, and I'm happy to see that he's still one of "The Usual Gang of Idiots" contributing to MAD on a regular basis. There aren't too many still there of the artists who were big in the 1970s, when I was a regular reader. Aside from Al, there's still Mort Drucker and Sergio Aragones, maybe a few others, but mostly there's been a newer crew illustrating in this millennium, including the wonderful Tom Richmond. My favourite was Jack Davis, but I don't believe he's been active at MAD for awhile now. 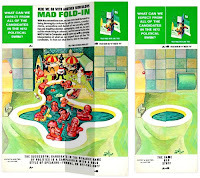 Even after all these decades since starting as an artist with the magazine in 1964, Al Jaffee is still coming up with his famous "MAD Fold-In" for the back inside cover every month. Frankly, I don't know how he creates those things - they're brilliant visual puzzles! Incidentally, he was also recently named "Outstanding Cartoonist of the Year" at the 2008 Reuben Awards, presented by The National Cartoonist Society. In order to draw this caricature of Al, I checked out what was available on YouTube, so here are a couple of neat interviews with him that I found. Happy Birthday Al! Happy Birthday Mr. Jaffee! I hope he doesn't run into a black cat. These were my favorite part of Mad magazine!!! the dudes like an artist/engineer/geniie from the brilliant bottle! Another parallel childhood influence, Peter. And a nice image too! Hey Pete, I just read an article you wrote about flash animation being no where close to the quality produced by traditional mediums. For the most part, I see where you're coming from, but just look at this flash animation for example. I am such a huge fan of MAD fold-ins. I remember being absolutely amazed by the first one I saw and that just got me hooked. MAD wasn't so easy to come by where I was though but that meant it was a treat every time I got one. Oh, and James - animating traditionally frame by frame in Flash and cleaning it up as if traditionally totally defeats any point of using Flash in the first place. If you're going to do it that way, you may as well do it with tactile paper, a pencil and being able to animate by feel when flipping pages because, yes, you'd get better results that way. James - I agree that the character design and the animation are very nice in that link you posted, however the sterile quality of both the vectorized line and the colour are devoid of warmth and humanity, so typical of the results in Flash. Actually, Bitter Animator has summed up perfectly my thoughts on the matter. HH! Great caricature, Pete. You captured Mr. Jaffee perfectly! "Arr, Step Lively There, Jim Lad!"